The 56th annual meeting of the American Association of Veterinary Parasitologists was held in conjunction with the Livestock Insect Workers' Conference and the International Symposium on External Parasites of Pets July 16-19, 2011 at the Sheraton Westport Chalet in St. Louis , MO. Over 240 parasitologists entomologists and students were in attendance. Below are two event photos. 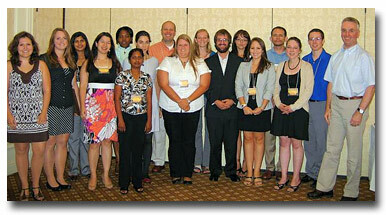 Nineteen students were presented young student investigator travel grants. 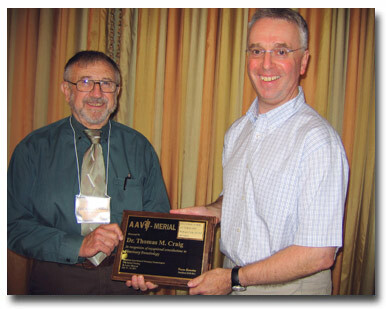 Dr. Tom Craig, Texas A&M University (left), was presented the AAVP-Merial Distinguished Parasitologist Award by Dr. Andrew Peregrine, chairman of the awards committee.